After three months off, Obama broke his silence in his adopted hometown of Chicago, speaking to high school and college students about the need for greater civic engagement. The 55-year-old Democrat, who ended his two terms at the White House in January – handing power over to Donald Trump – said he was “incredibly optimistic” about the future, and that problems facing America could be solved. 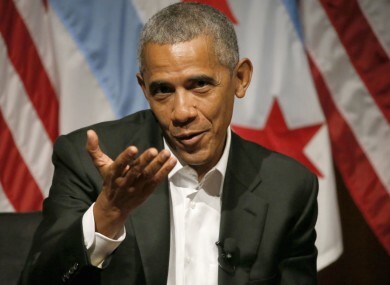 “On the back-end now of my presidency, now that it’s completed, I’m spending a lot of time thinking about what is the most important thing I can do for my next job?” Obama said in his opening remarks at the University of Chicago, where he once was a lecturer at the law school. What I’m convinced is that… the single most important thing I can do is to help in any way I can to prepare the next generation of leadership to take up the baton and to take their own crack at changing the world. Until today, Trump’s predecessor had not given a public speech or an interview since leaving the White House on 20 January. He has tweeted a few times and issued a few statements through a spokesman, notably to defend his signature domestic policy achievement, health care reform – which Trump’s Republicans are now hoping to dismantle. Obama also spoke up when his billionaire successor accused him of personally ordering the wiretapping of Trump Tower during the 2016 presidential campaign. But for now, he has abstained from any substantive commentary on how Trump is doing, in keeping with presidential protocol which dictates that past residents of the White House do not step on the toes of the current occupant. That silence comes in the face of accusations by Trump on everything from Syria, with the Republican all but accusing Obama of bearing responsibility for chemical weapons attacks by the Damascus regime, to gang violence in America. Youth civic engagement and community organising are at the heart of the mission of the Obama Center, which is located on Chicago’s South Side, where Obama started his career as a community activist. Yesterday, America’s first black president privately met with at-risk youth from the South Side to discuss gang violence, jobs and training, according to The Chicago Tribune. The Obamas are currently renting a house in Washington, where their youngest daughter Sasha is finishing high school. Since leaving office, Obama has gone kitesurfing in the Caribbean with British billionaire Richard Branson. He then spent nearly a month in French Polynesia, where he vacationed on media mogul David Geffen’s yacht – and was reportedly working on his book. But after today, his public schedule will pick up pace. On 7 May, he will receive the 2017 Profile in Courage award from the John F. Kennedy Library Foundation in Boston. He will give a private paid speech during a visit to Italy. And then on 25 May, he will deliver a speech at a Protestant church gathering at the Brandenburg Gate in Berlin, with Chancellor Angela Merkel at his side. Obama, who developed a close working relationship with Merkel during eight years in the Oval Office, visited Berlin in November as part of his last foreign tour before handing over to Trump. Read: Where did all the fuss about a US president’s first 100 days come from? Email “'So, uh, what's been going on since I've been gone? ': Obama returns to public spotlight”. Feedback on “'So, uh, what's been going on since I've been gone? ': Obama returns to public spotlight”.